[Notes added 8/20/2016: Do NOT USE! See concluding note at end of post.] 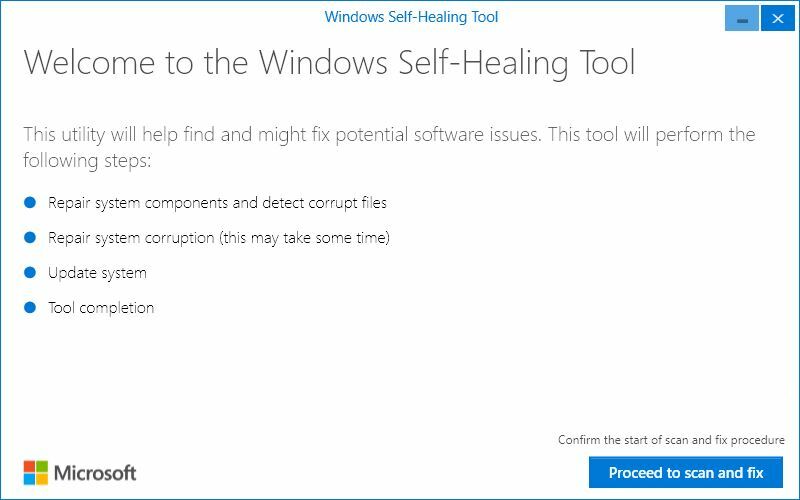 Thanks to an intrepid poster to the Microsoft Community forums, a link to an experimental Windows Self-Healing Tool is now available. Apparently, MS Support offers this tool to individuals who’ve experienced widely-reported freezing issues that follow in the wake of applying the recent Anniversary Update to Windows 10. But the tool is described as still in test, and “not yet released as part of the new System Update.” I’ve downloaded it and tried it out myself. But because none of my systems is subject to post-AU freezes, I can’t say if or how well it works to fix them. I can say, however, that the tool does no [apparent] harm to healthy test systems. That said, it does require some minor clean-ups to restore them to fully normal operation. The tool is named WindowsSelfHealingTool.exe, and runs from File Explorer. From what I see, the tool combines Windows system maintenance commands and activities to restore system health and function. In section one, it resets system date and time to make sure update and other system services work properly. It also appears to reset Windows 10 to default settings and to replace key applications such as File Explorer. In section two, it probably makes use of DISM and the System File Checker. The former serves to repair the WinSxS component store and the latter to detect and replace corrupt or damaged system files. In section three, it appears to attempt Windows Update repair (stop then restart key services, check update capability). Then it applies any outstanding updates. The final reboot returns control of the system to the user. All in all, the tool works through a standard but helpful sequence of system checks and repairs. Thus, if the Windows Self-Healing Tool makes it into production, it could become a useful item in any admin’s toolbox for Windows. Close tool5All operations completed, you can close the tool now. click hereNot supported Windows version9This tool is not compatible with your version of Windows.qThis may take several minutes. Please ensure the device is charged and connected to internet during this process.